Assalamualaikum. 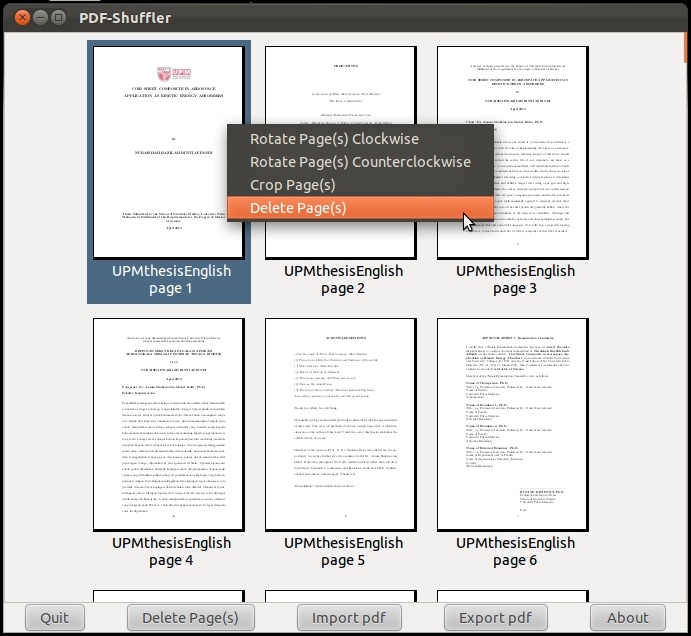 To remove, rotate, crop and re-arrange pages in a PDF file i use PDF-Shuffler. See Pic 1. 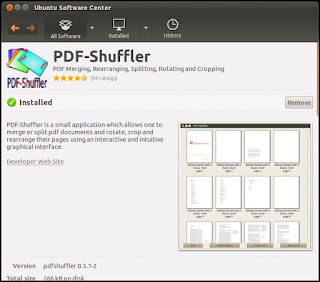 You will need to install PDF-Shuffler on your machine first before proceeding to Part B.
Pic 1 - More info on PDF-Shuffler in Ubuntu Software Center. 1. To install, run Ubuntu Software Center. 2. In the search field, type-in the search term "shuffler". The search results will auto-filter. See Pic 2. Pic 2 - Refer Step 2. 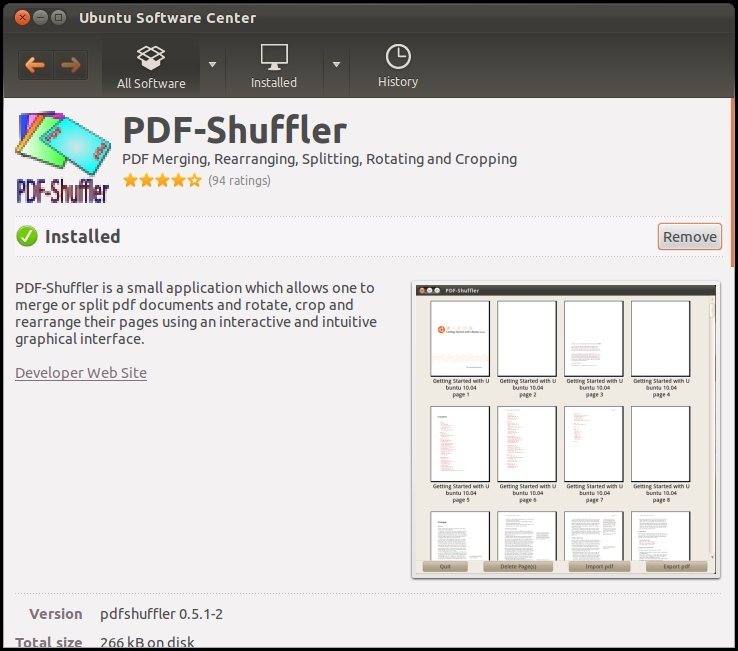 Searching for the PDF-Shuffler package in Ubuntu Software Center. 3. Select the PDF-Shuffler package, see Pic 2. Two buttons will automatically appear. To install, click the Install button. Once the software is installed, the Install button will turn into the Remove button. See Pic 2. To read more about the package, click the More Info button, see Pic 2. When ready to install, click the Install button. 4. An Authenticate window will appear prompting for your password. Key-in your password in the Password field, then click the Authenticate button. See Pic 3. Pic 3 - Refer Step 4. Password to allow installation of PDF-Shuffler. This part will show you how to manipulate pages using PDF-Shuffler. 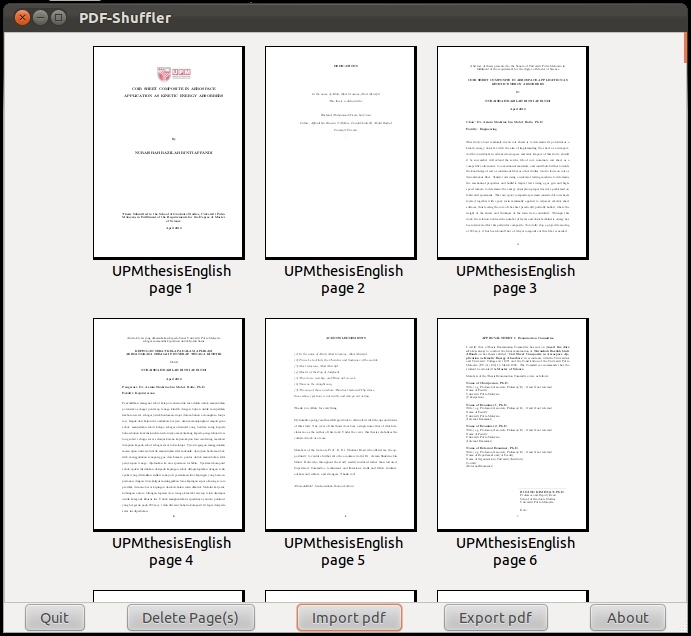 Pic 4 - The PDF-Shuffler software. 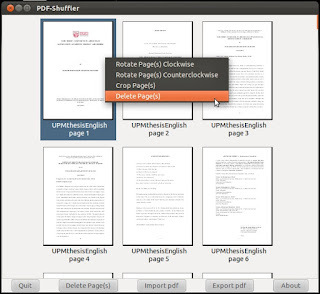 (b) simply drag-and-drop your file into PDF-Shuffler. The imported document will look something like in Pic 5. Pic 5 - Refer Step 6. Importing the document. Pic 6 - Refer Step 6. 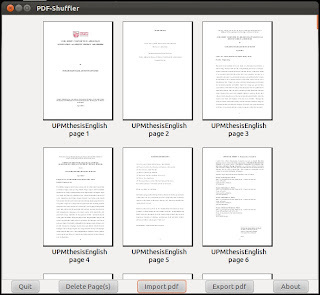 The imported PDF document in PDF-Shuffler. Pic 7 - Refer Step 7. The features available in the right-click menu. (b) right-click then choose Delete Page(s) from the menu. Select the page that needs to be cropped, right-click then choose Crop Page(s) from the menu. The Crop Selected Page(s) window appears, see Pic 8. Enter the measurements needed to crop page then click the OK button. To "uncrop" the cropped page, right-click then choose Crop Page(s) again. In the Crop Selected Page(s) window, change the measurements to zero then click the OK button. Pic 8 - Refer Step 7. The crop margins. Select the page that needs to be relocated then click-hold-drag the page to its new location. Note that the "undo" / "redo" feature is not available in PDF-Shuffler. 8. To "save" your work, click the Export pdf button (refer to Pic 4). The Export ... window will appear. Select the location and give the file a name then click the Save button (see Pic 8). Pic 9 - Refer Step 8. Saving the edit. I typically use PDF Mod for this sort of thing.